A good rule of thumb for car tuning, and life in general, is that just because you can do something doesn't mean you should do something. This "completely custom" Mazda is proof of this rule. It's also proof that Monster Energy drinks will destroy your brain eventually. What we have here is a 1998 Mazda 626 sedan going for the low, low price of just $4,000 on Tampa Craigslist. (Did you have any doubt that something like this could only come from Florida?) On its own, the 626 was a competent if extremely boring and anonymous Japanese sedan, the kind of car that faded into the background when compared to the Accords and Camrys it competed against. This noble Floridian sought a way to jazz up his 626 and make it stand out a little more. I'd say he succeeded, but not in a good way. 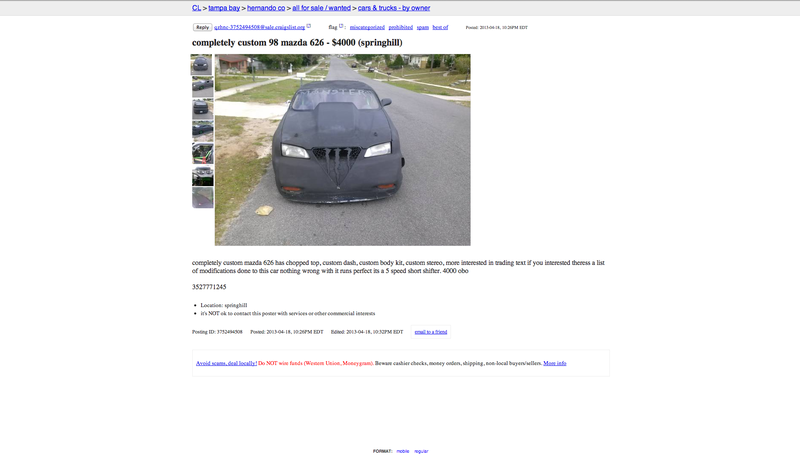 The ad boasts the car has a "chopped top, custom dash, custom body kit, custom stereo" and a host of other unlisted modifications. 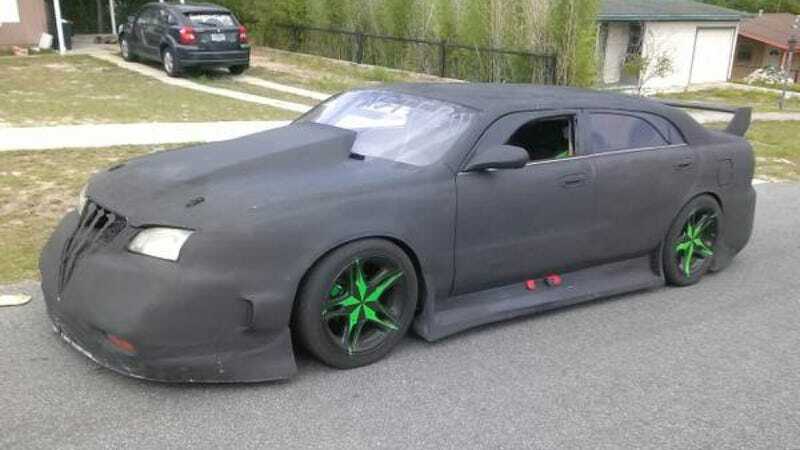 Highlights for me include the neon green rims, the Monster Energy logo on the grille, the massive hood scoop, the bizarro bodykit and the vaguely Evo-esque rear wing. It's clearly some kind of project car in progress, and I sort of see what the owner was going for, but I don't think it was panning out the way he wanted. But the Monster Energy-induced brain damage becomes most apparent when you wiggle past that bright green roll cage and step inside. I can't decide what I like best here — the chain link steering wheel, the speakers plastered everywhere in a haphazard fashion, or the center-mounted dashboard coated in neon green paint with the word "custom" hand painted above the gauges. Who does stuff like this? On the plus side, it has a short-throw five speed manual! That makes it ideal in case you decide to drag race other energy drink-themed customized Japanese family sedans in your town. Oddly enough, this bad boy has made its rounds on the Internet before. Yahoo! Autos highlighted it earlier this month when it was for sale on Ocala, Florida Craigslist for $1,875. Why did it more than double in price since then? I don't know. I'm done trying to explain this thing logically. I haven't had nearly enough Monster Energy drinks in my life to even begin to understand it. All I know is that four grand is a little steep for this beast, short throw shifter or not. Luckily, the owner says he's "more interested in trading." Any takers? Photos credit Craigslist. Click here if the ad disappears.